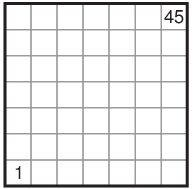 Shade some blank cells so that the grid is divided into white regions. Each white region contains exactly one numbered cell and has same area as the number. Two white regions may only touch each other diagonally. All shaded cells are connected to each other horizontally or vertically. Shaded cells do not form 2X2 squares.